Global Premier 56 secure modem, V.90, 2 wire dial and leased line, Remote Configure and Password Security Global 3460 Series Modems. Operates as high speed fax, allowing communication with any ITU Group III compatible fax device, anywhere. AT driven remote configuration allows option settings of a remote unattended modem to be changed over the phone line. ITU V.8 compliant automode ensures connection at the highest common rate. With Automatic Rate Adaption (ARA) the modem dynamically adjusts its data rate backward or forward. Multiple levels of security from password, to password with callback, to user programmed. Capacity is 20 passwords and 20 phone numbers. ITU standard V.42bis/V.44 for asynchronous error correction and data compression. 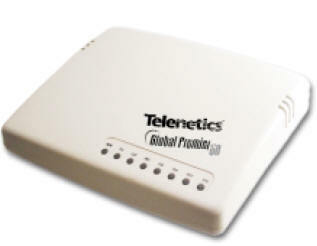 The Telenetics Global Premier 56 data/fax modem, based on Conexant’s award-winning V.92 & V.34 technology, provides outstanding performance. The Global Premier 56 is a desktop model that receives data up to 56kbs and transmits at 48kbs, the highest data rates available today. The desktop Global Premier 56 offers both synchronous and asynchronous data support with throughput up to 230.4 kbps. The Global Premier 56 incorporates advanced technology that enhances operation on less-than-ideal transmission lines and higher HTML compression using V.44. Ideal for corporate and commercial applications, the Global Premier 56 easily handles tasks such as e-mail, remote LAN access, telecommuting, remote file transfer, access to the Internet, and any other applications that require fast, reliable transmission speeds.